DeLIGHT your room decor with our room style ideas! All furniture purchased and selected and only one thing missing: Lamps! Thinking of your best interest, we selected amazing contemporary lamps that fit any interior. Stay tuned and see the living room inspiration we have ready for you! When decorating, we usually leave the lighting to the end, as it’s something we many times leave unnoticed for being too simple and not aesthetically pleasant enough. Follows some amazing lighting inspiration to help you get excited about lighting and bring your room decor to another level. Diana is a contemporary lamp from DelightFULL perfect for any contemporary kitchens, but it does also look great as a bedside lamp in an industrial-inspired bedroom. This lamp has an amazing feature that allows the user to adjust the lamp, pulling it closer or further, as will, in order to better fit your needs. Whether you need closer light to see something better, or further light, to enjoy your dinner, this is the right fit for you! Next, for more living room inspiration is Botti modern chandelier, that instantly takes us into a music concert starring Chris Botti and showcases the high-quality craftsmanship for which DelightFULL is best known for. 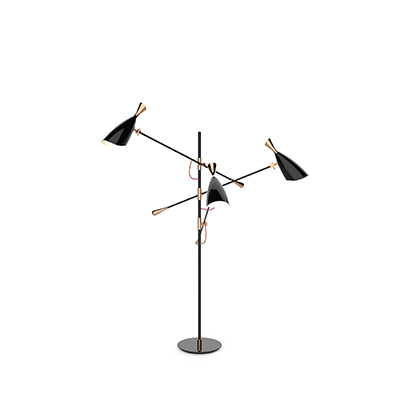 This is the perfect hanging lamp to display on a mid-century modern living room, or a sophisticated hotel lobby. Also featuring in the photo above is the sleek and stylish Dandy sideboard, from Essential Home, which is very versatile, as it can also be used as a drinks cabinet and be placed both in a living or dressing room. More contemporary lamps come your way and this one is a banger! Inspired by the molecular composition of the atom, Atomic ceiling lamp can be used in a modern entryway, and it also works beautifully as a bedroom ceiling lamp, especially in kids’ bedrooms! Also featuring in the photo above is Monocles sideboard from Essential Home, with an extreme character and high end look, it creates an amazing modern room design along with Atomic ceiling lamp. More room style ideas come your way, with contemporary lamps to die for, and this time is Armstrong Floor, with it’s minimalistic style and a clear usability, perfect for every single modern Scandinavian living room or office, providing an exquisite touch to your interior design! Also in the picture above are Monocles Dressing Table, to add a striking addition to your glamorous boudoir and the fun and practical Florence Stool, from Essential Home. For more room style ideas we now show you one hell of a piece that will inlight your room as constellations that fill the night’s sky. Stardust floor lamp is a contemporary lamp that will bring an astral beauty to your space! If you wish to complete this look, why not add a Hudson Armchair from Essential Home? It will look perfectly with this lamp! Of course we couldn’t forget the useful table lamps, that make all the difference in your room interior decor or desk display, per instance, as it’s something that is more at eye level and for that more noticeable. This said, the next contemporary lamps presented are Turner table lamps, inspired by the electrifying and memorable dance moves of the iconic pop singer. A versatile piece, that can be used in almost any room of your house. The next contemporary lamps, Amy Table, is inspired by one of the greatest British singers and songwriters of all times, Amy Whinehouse. With a glossy black lampshade that resembles her iconic hair and a small brass detail that reminds us of her golden earring, DelightFULL was able to create an unforgettable reading light perfect for a vintage bedroom, or a retro home office. Also in the photo above are Edith sideboard, a statement storage piece for the retro chic lovers and the Diamond Small Mirror, inspired by the asymmetrical and dazzling shapes of a Diamond rock. For last but not least, wall lamps for those areas where a suspension lamp isn’t enough as the room is too big, per instance, and needs more light. Norah wall lamp will sit beautifully next to a piece of art in your living room decor, as these contemporary lamps will transmit a sense of elegance and sophistication in every single space. Always thinking of your best interest and every single corner of your home, the next contemporary lamp looks amazing in and outdoors. Basie wall light fixture is a modern representation of the sci-fi aesthetics of the 1960s, and has a set of distinctive features which make it a stunning statement piece. This ends our contemporary lamps inspiration for your interior design, that we hope you can find useful! Make sure to comment which piece is your favorite and how you’d style them, we’d love to hear your thoughts!